Well done, sounds a very interesting job. Thanks for the advice. I managed to get the job done and we used the cnc to cut the handrails. 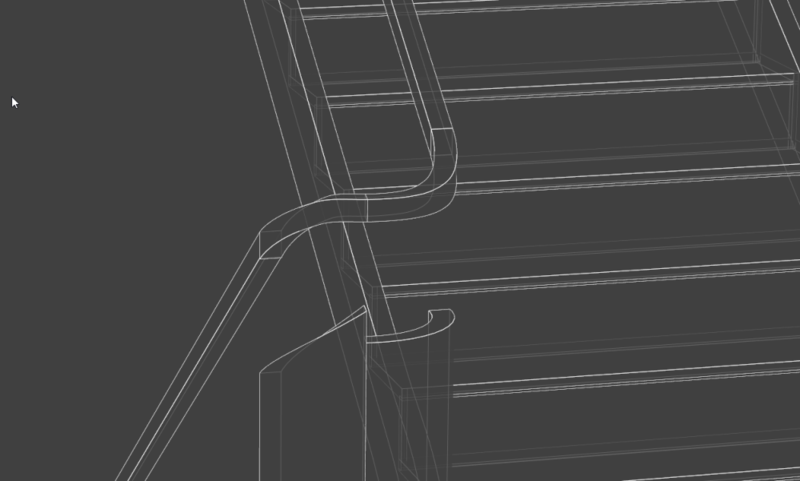 In the end I saved a 3d DXF of the handrail and opened it up in Alphacam then saved it as an IGES file. I know someone who was able to use that and then draw a solid model in Catia and then send me the step file. It worked pretty well. I was going to put a photo up but I think the file is too big. Fitting wreathed curves is quite a complex task that can have several solutions. The easiest solution is to set up the handrails not to have only curved sections and avoid wreathed rails. However on your stair this would require a redesign of the steps. In your case, if you can’t move the steps you have to use wreathed rails. and adjust the rake angles of the wreath to follow the straight handrails. 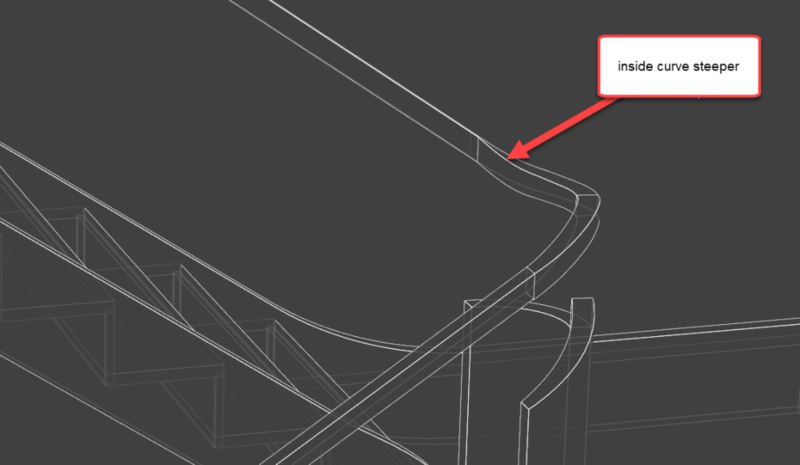 In StairDesigner 7 you can adjust the shape of the wreathed sections just like adjusting the shape of stringers. When adjusting wreathed sections it’s important to keep in mind that you are adjusting the inside developed face. 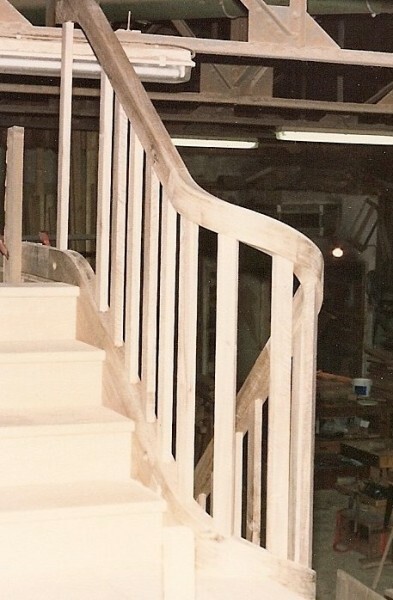 This means that if the rake is smooth on this face the exterior face is shorter and will dip down faster and the rail may not appear correct in StairDesigner. However, If the rail is not molded, it’s possible to deform the section of the rectangular rail to compensate the change in angle. this is especially easy in your case with 2 wreaths joining on the landing as the false angle is spread over both wreaths. I attach a StairDesigner model that has set this up. I’m not sure what you mean by programming the wreaths on the CNC. If you are making them in solid wood I would bother programming a CNC for 2 wreaths. I’d make them faster by hand. If you are building from horizontal laminates them the CNC can be used cut the laminates. If using traditional laminates CNC can help to make the jig. The easiest would be to make a jig and laminate them. If you are also making a laminated stringer you can make the stringer wider and cut the handrail from the top of the stringer. In this case I would build the stringer with horizontal laminates and making it wider cut the handrail from it. Hi Guys I’m having problems with the curves on this stair I want to put one at the top on the landing and one at the bottom and run a continuous handrail over the top. the stair will have glass panel balustrade and solid ash handrail. I am going to make the curves with flexi ply and ash veneer. I will cut out the jig for the curves on the cnc. I would also like a bit of advice on how to programme toolpaths for my cnc to make the wreathed handrails.